It’s no secret that the weather conditions during the winter can become quite extreme – just look at the record-setting low temperatures that were recently seen in Chicago, for example. Extreme snow or frost can potentially lead to very dangerous situations, especially for wild animals. 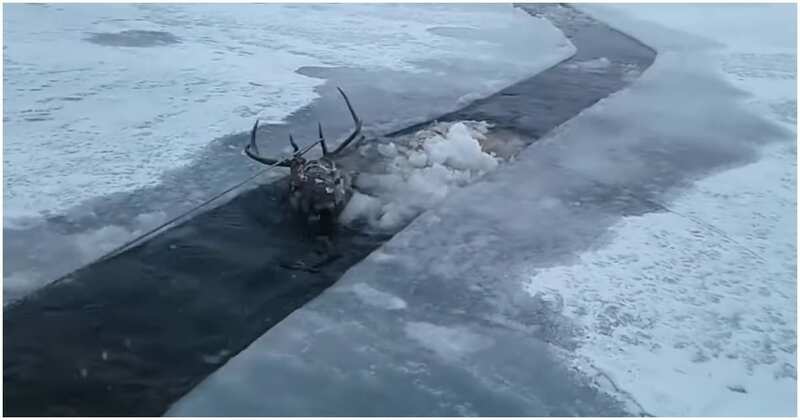 A poor red deer managed to get completely stuck in an icy lake in Siberia, Russia. Its life was hanging on a very loose thread. It’s unclear how the deer fell into the lake, but what was completely clear, is that he couldn’t get out at all. He was inches away from drowning and his cries could be clearly be heard. Luckily – those cries were actually heard by people who were in the area. When they spotted this majestic animal in its serious predicament, they realized that he needed urgent help. The people who found him were animal hunters, and they didn’t hesitate for a second to try and rescue the deer. 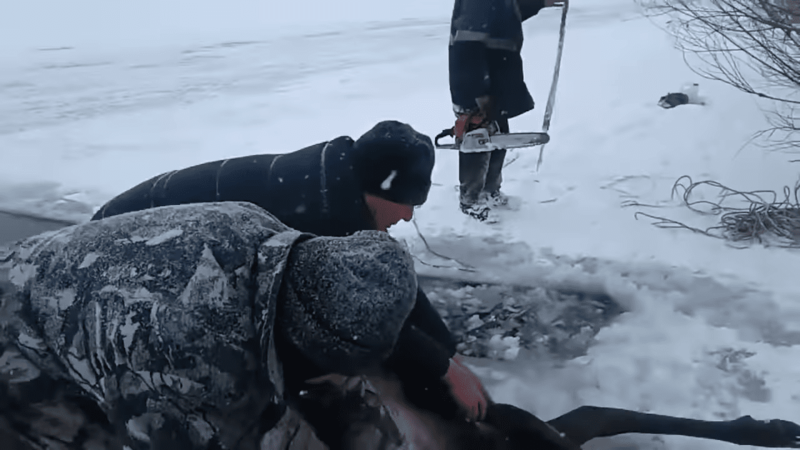 The situation was severe and life-threatening, and the local hunters did everything they could to get the drowning stag out of the icy and freezing lake. 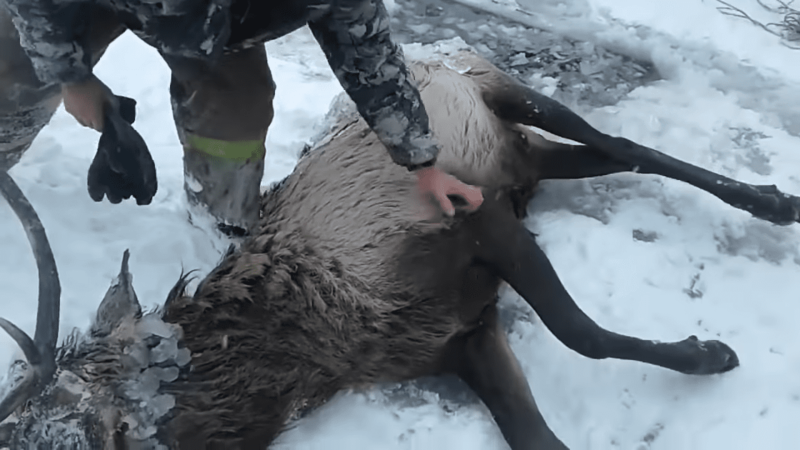 It may sound a bit weird to see animal hunters saving an animal instead of hunting them down and killing them – but they clearly realized that this poor deer needed help. These people had no intention of being cruel and wanted to make sure that the deer would be able to stand on his own feet again. The rescue operation didn’t go as smooth as they hoped, but the hunters were determined to get him out of the ice. The frozen lake he was stuck in, the Barguzin which crosses the Ulan-Ude area in Siberia, proved to be very difficult to cut through. 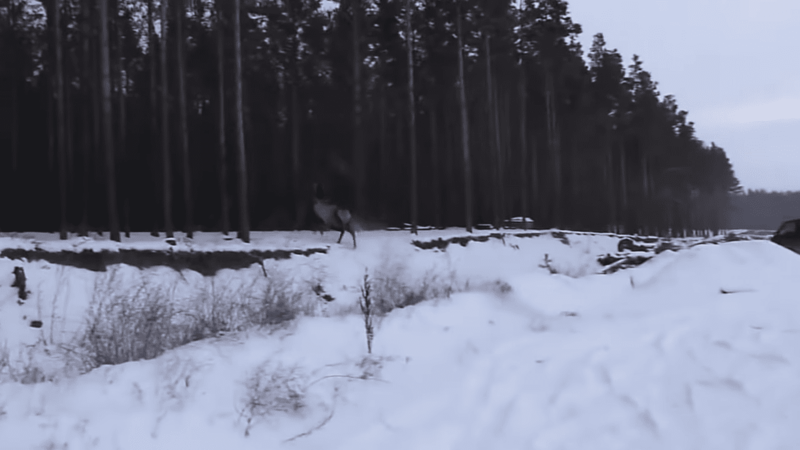 There were four hunters in total who did their best efforts to try and cut pieces of ice, in order to create enough room for the deer to maneuver in. 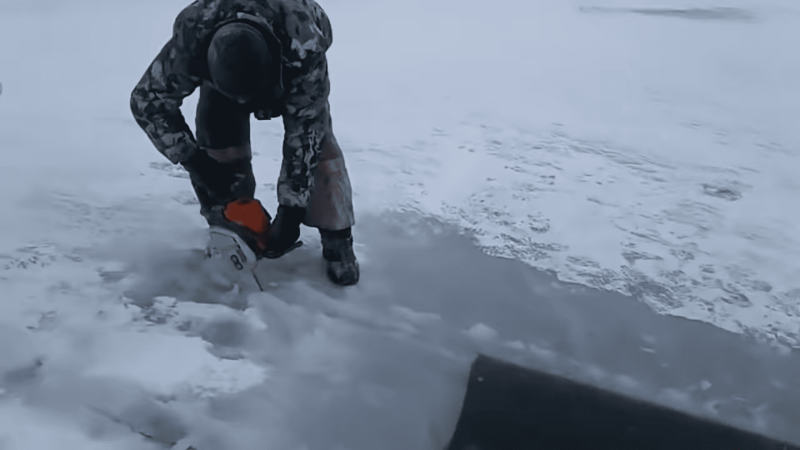 They were equipped with a chainsaw, but cutting the ice still proved to be a big obstacle. When there was finally enough room, they attempted to pull out the heavy animal out of the icy water. 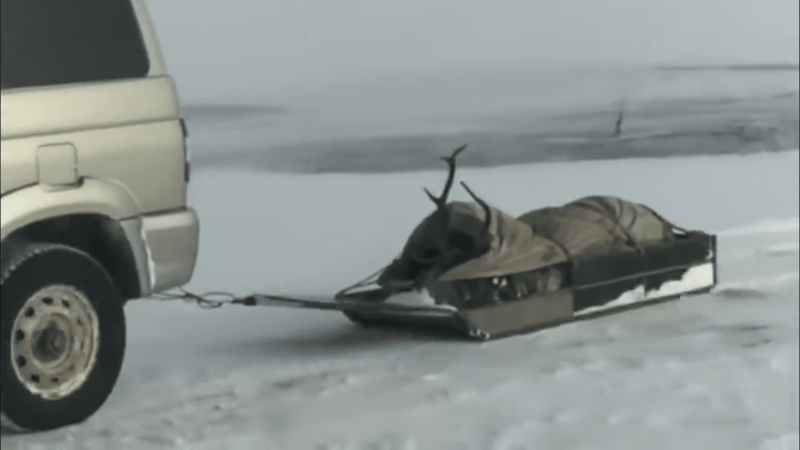 As you can imagine – this animal was heavy, and even four grown men were seriously struggling to get the life-threatened deer back to some drier grounds. 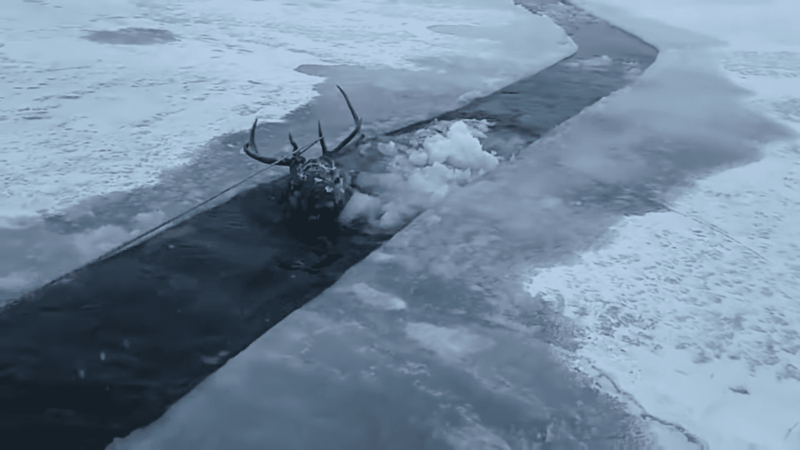 In total, the men spent four hours getting the deer out of the ice. Some parts of the rescue attempt were filmed by Aleksey Baluev. They checked if the deer had any substantial injuries on the outside, but they also realized that the most dangerous element of all would simply be the cold. “We need to get it away from the cold, Baluev” says to his friends. 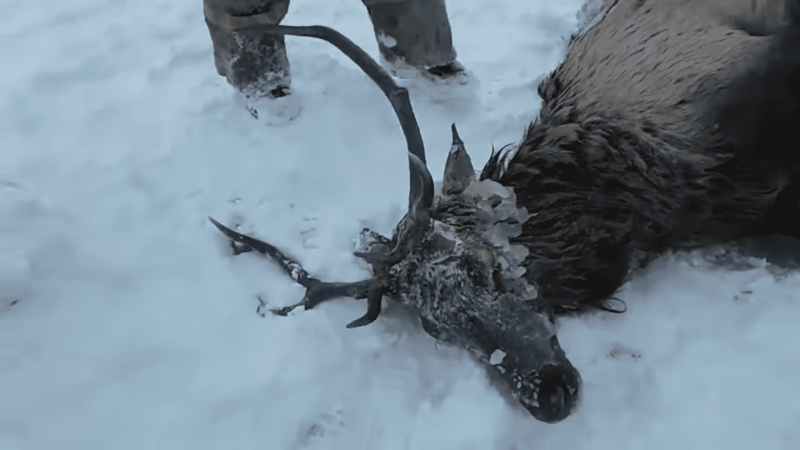 Even before the stag finally made it to the ground, you could see he was quite immobile and still suffering from the freezing temperatures and ice cold water. 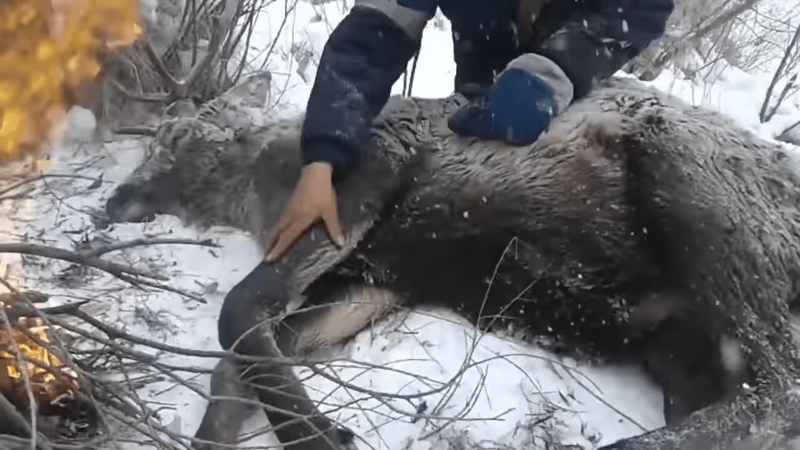 The entire hunting crew then furiously started rubbing over the animal’s fur with their bare hands to try and get his blood circulation up and running again after they managed to get him out. Luckily, a fire was able to give some warmth that probably ended up saving the red deer’s life. The hunting crew then took the deer to a local garage afterward and continued to take care of him. The deer, still very much freezing and in peril, needed to warm up even more. Hunters and the garage crew were able to find a large piece of lard to keep him somewhat warm, and they even gave him no less than 150 grams of vodka. They figured that it would warm the deer up from in the inside, and it certainly looks like it didn’t hurt. When the deer was finally able to stand on his own feet again, the hunters knew it was time to release him back into his natural habitat. Making sure that he was a-okay, they took him to one of the edges of a nearby forest as they watched him depart into the wilderness, once again. 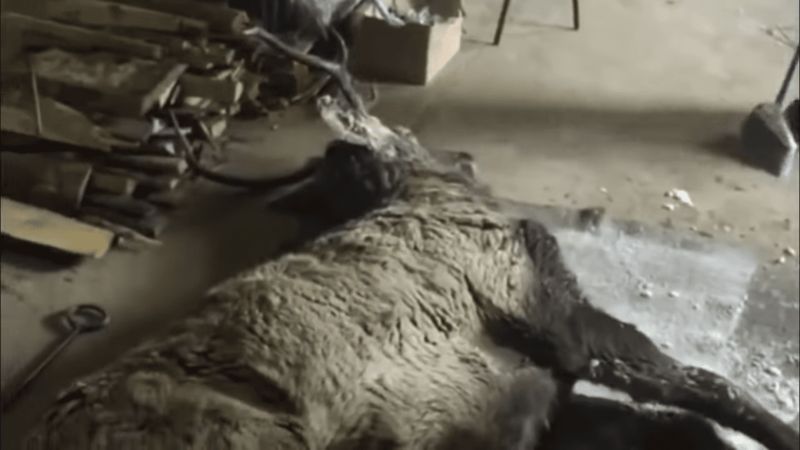 Hunter or not, these people absolutely did the right thing by rescuing this deer – even though the rescue mission itself proved to be almost impossible to pull off safely.